OF ALL the flowers in the plant kingdom, perhaps the most loved is the rose. Their unsurpassed beauty and fragrance has inspired countless poets and artists, as well as gardeners. 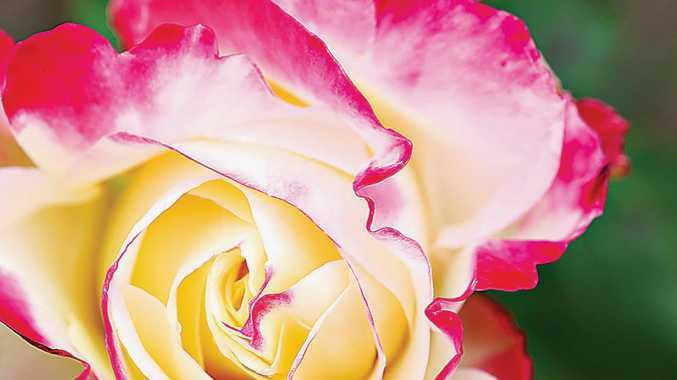 Winter is a great time to plant bare-rooted roses. You can purchase beautiful, strong, bare-rooted roses for less than half the price of the potted specimens available at other times of the year. Bare-rooted roses have been grafted and then grown in fields. In winter, they are dug up, and, after most of the roots and leaves have been removed, they are packed in boxes and sent to their destination. Stored properly, they will survive for about two months before they need to be planted. Roses are ancient plants, and they have been bred and traded for thousands of years. There are more than 30,000 varieties of roses, including all the hybrids in existence today, so you should be able to find at least one that pleases you. I have a few favourites. Mr Lincoln is a deep red with a rich fragrance - perhaps the best red rose there is. Iceberg is a classic white, very hardy and free flowering but not as strongly perfumed as some others. Double Delight and Peace are gorgeous, as is Seduction. And then there's Just Joey, Apricot Nectar, Perfume Passion, and so, so many others. Every year, new ones are released, some good, some not so good. Roses need a sunny position, at least six hours a day, good drainage, and plenty of well-rotted organic matter in the soil. To minimise the risk of fungal diseases, ensure that there is plenty of airflow around the roses - they don't like to be crowded by other plants. To plant a bare-rooted rose, dig a hole about 30cm wide and 25cm deep that will easily accommodate the roots without bending them. Add some well-rotted compost or manure to the soil. Form a mound in the bottom of the planting hole, and spread the roots over the mound. Adjust the height of the mound so that the grafting point is about 2.5cm above the soil surface. Fill the hole with soil and drench with seaweed solution to stimulate root development. Mulch the surface of the soil. Don't add fertiliser at planting time as you may burn the developing roots. Roses are heavy feeders, so fertilise frequently with your favourite organic fertiliser throughout the year. Spray fortnightly with a seaweed solution to help prevent fungal diseases. Roses are pretty drought tolerant. As with many plants, a deep watering once a week is better than a light sprinkle every day, because it will force the roots down into the soil. Good companion plants for roses include chives, marigolds, yarrow, scented geraniums, parsley, thyme, lavender, sage and catmint. Keep companions a minimum of about 30cm away. Is there a termite resistant mulch?